1. Generously coat the chicken with BBQ sauce and place on a lightly oiled broiler pan. Place pan under a preheated broiler and cook, turning once, 12-14 minutes or until done. 2. Meanwhile, heat the beans in a small pan. Warm tortillas according to package. 3. Divide the beans equally over tortillas, place chicken strips over the beans and top with salsa and a dollop of sour cream. Serve immediately. 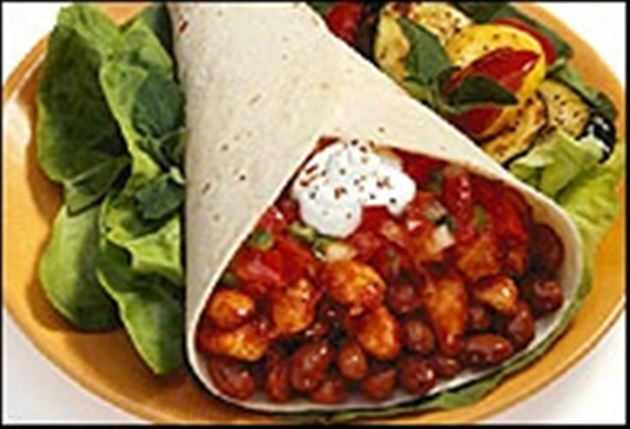 Enjoy this delicious chicken bean burritos Mexican recipe!